Disillusion is the greatest gift I can give you. But, because of your fondness for illusion, you consider the term negative. You commiserate with a friend by saying, “Oh, what a disillusioning experience that must have been,” when you ought to be celebrating with him. The word dis-illusion is literally a “freeing from illusion.” But you cling to your illusions. How do I distinguish fundamental beauty from fleeting, or superficial, beauty? What is the nature of illusion? 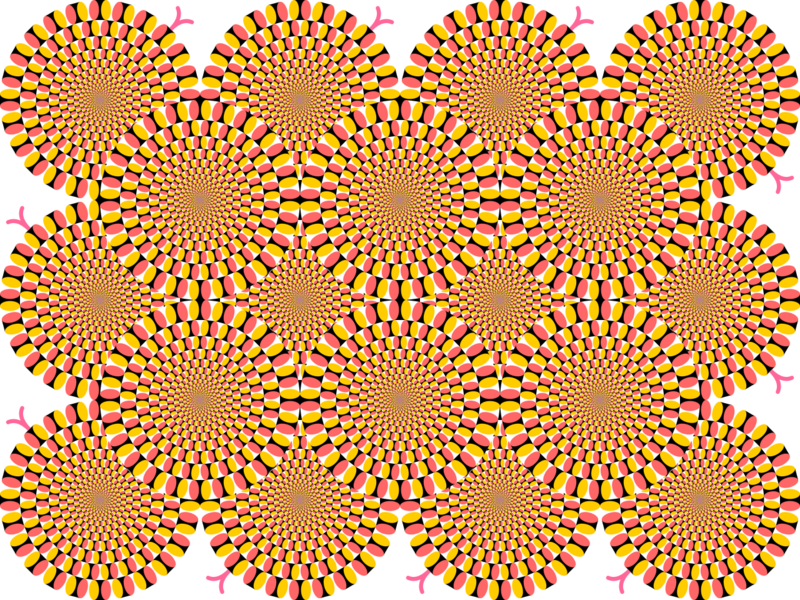 What is the nature of dis-illusion? How does one get through illusion? I know the above quote does not reference beauty; however, when I read, “you do not fundamentally enjoy your life”, I thought, “What is fundamental beauty”? And, it occurred to me, that paragraph could apply just as easily to beauty, and to anyone chasing superficial beauty. If that were the case, the paragraph would read something like this: You are suffering, you do not fundamentally enjoy your life. Your cars, your clothes, your lawns and houses distract you from acknowledging how little you enjoy life. If this is the case, what do we do about it? How do we relieve the suffering of people who don’t know they are suffering, who are surrounded by “beautiful” things, and wonder why they are not happy? How many psychiatrists does it take to change a light bulb? – Only one, but the light bulb has to really want to change. This is a bunch of lines going in different directions, but the mind interprets it as squares. Same thing with people who love their beautiful things–people can learn a deeper beauty, if they really want to. Let me be clear: things can be and are beautiful, but the beauty that I am getting at in this Journey is the one brought to the things, through our hearts, souls, feelings, and love. Of themselves, things do not contain this kind of beauty, and that is why, of themselves, they do not bring happiness, fulfillment, or a fundamental enjoyment of life. The first paragraph of the Millman quote is instructive here: Superficial beauty is an illusion that would require dis-illusionment. Instead of those things of beauty as a way to fulfillment, they are really chains binding the person to unfulfillment. In a way, it’s a simple question, “Does this thing make me happy?” For many people, the answer is “yes”. We live in a materialistic society, bombarded with marketing that tells us how to improve, be better, be happy–by simply buying products. The outer message is constant, and if people are not inclined to try to think something else, something different, the “default” programming is what surrounds them in marketing and advertising. 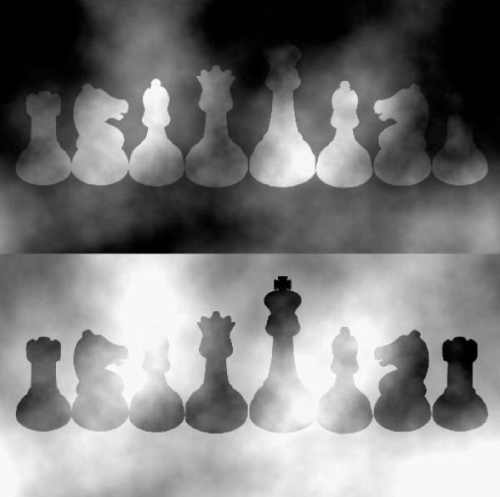 Both chess sets are exactly the same color, the background just changed. This is why it’s so important to think for oneself. Are you happy? What makes you happy? When do you feel fulfilled? What fills your heart with beauty and joy? These answers are something people must experience and recognize for themselves. People need the willingness to disregard the easy answer, the messages on the screen, with friends or family, or in music. Finally, we get to Millman’s point about fear: Breaking down illusions can be scary. In a later scene in that book, Dan, the main character has a moment of really seeing himself through the Peaceful Warrior’s eyes–and it freaks him out. He feels berated, criticized, and ridiculed. When people’s illusions are exposed, there is a moment of panic that everything a person has ever lived or believed is false, or upside down. And it is, in a sense. 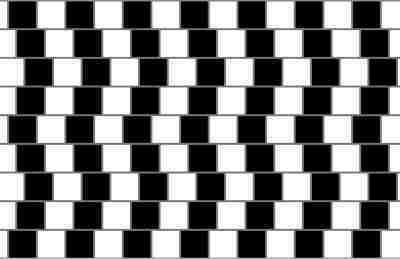 The horizontal lines are straight, but appear to be bent. Getting turned right-side-up, having those illusions dismantled, is emotionally similar to being in a nice, safe bed on a gravity-producing spaceship, then losing power, and therefore losing gravity, and drifting about directionless, then being slammed to floor, when the power turns back on (a scene from the movie Passengers). When embraced, such transitions can be gentle and exciting. However they go, those transitions are the first step to seeing and experiencing Beauty as it is, as it is within you, as it is as you.